Wholesale Custom Mesh Beach Bag, Personalized or Blank. Insulatted bottom. Promotional, Inexpensive. Best price in America. Bulk custom imprinted beach bags with insulated lower compartment. We also supply wholesale blank (not imprinted) Beach Bags: see the Price Table below. 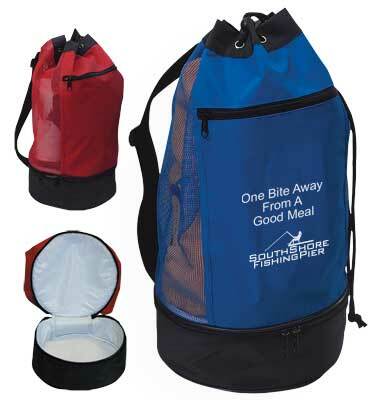 Budget Prices in USA and Canada for wholesale promotional Insulated Beach Bags. American clients pay no taxes. The unit prices below include your 1-color custom imprint on one side, or they are for blank (not custom imprinted) Insulated Beach Bags. You may order any quantity above the minimum. Please check also our wholesale cotton canvas beach bags our inexpensive drawstring barrel bags and our beach mesh totes with coolers . Colors: Royal Blue or Red, both with Black Trim. Packaging: 25 per carton @ 20 lbs.